Boat load O waterfoul - The BSB SportzMan - A Forum for OutdoorzMen! looks good. was that the Mud boat? no ice? Speaking of boats.....what is happening on the water-wind boat??? I about have the drive up and running again, a new mechanical disturber in and a plan how to add the floatation pods . Wait....he actually eats them? Don't they require the same earthworm glaze as woodcocks? Looks like it musta been a fun day for sure. mostwaterfowl prepared/cooked properly are very tasty! key word there IBD "most". coots, magansers, sardines....all the same. ..........Agreed Bear on the not so tasty waterfowl/fishes......however, even the "good" ones need to be prepared/cooked properly to get the best "taste" from them. 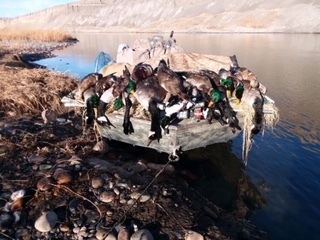 No baking for me, all waterfowl are cooked in a Cast Iron Skillet on stove top....with proper marinating/seasoning etc. I tend to prepare them with some sweet sauces, pineapple. I only eat the breast. Use to clean whole bird and pluck, then parifin to get pin-feathers out. Now I gut them and pluck the breast in the field. chill them and when I get home use my fish filet knife. Two perfect pieces! Few wild birds have enough meat on legs and wings to interest me. Grind them up mix them all together and make "Duck" jerky.